This is a non-contact class using bags and mitts. You will learn the basic punches, jab, cross, hook and uppercuts. And given Coach Rob’s past muay thai experience, will throw in elbow strikes and knee strikes as some really good self defense options. A good knee to the groin/chin, cross to the adams apple, or elbow to the eye socket can provide you enough time to get away from a street confrontation! This is a great opportunity to apply fitness as well as “learn and play new sports” which is an often missed CrossFit opportunity. Boxing gives a really good chance to train in the horizontal plane, a plane that is often ignored in training. Most of how we train in a closed loop environment, in that we do not have to react to anything in our training. 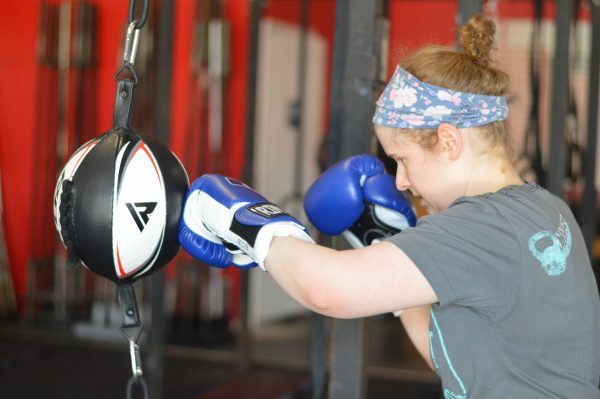 Training with mitts and defense drills give us an opportunity to work within an open loop environment where you have to react to a stimulus like seeing a target and striking it, or reacting a punch by slipping, parrying or blocking. Who is ready to rumble?